It’s zucchini time of year so I’ll probably be posting some zucchini recipes here in the next few days. These are the Sunday morning treats for the Sunday School classes! Brianne, are you peeking? This came from a magazine somewhere along the way, maybe an advertisement for the raw cane sugar called for in the recipe? Not sure. Heat oven to 350. Sift flour, baking powder, baking soda, salt and cinnamon then set aside. Combine sugar and eggs and beat at medium for 2 minutes. Gradually add oil, beating constantly 2 – 3 minutes. Add zucchini and vanilla and blend well. Stir in walnuts and raisins. Fold in sifted dry ingredients just until batter is evenly moistened – be careful not to over mix. (Just a note from me, this batter is really runny but the muffins came out fine so don’t worry about it!) Spoon (or scoop!) batter into non-stick muffin pans or use muffin liners. Bake 25 minutes or until lightly browned. Let stand 10 minutes then turn muffins out onto rack to cool. The recipe says it makes 24 muffins but I ended up with 36. Do you think this recipe will work with regular sugar? Whats the difference? 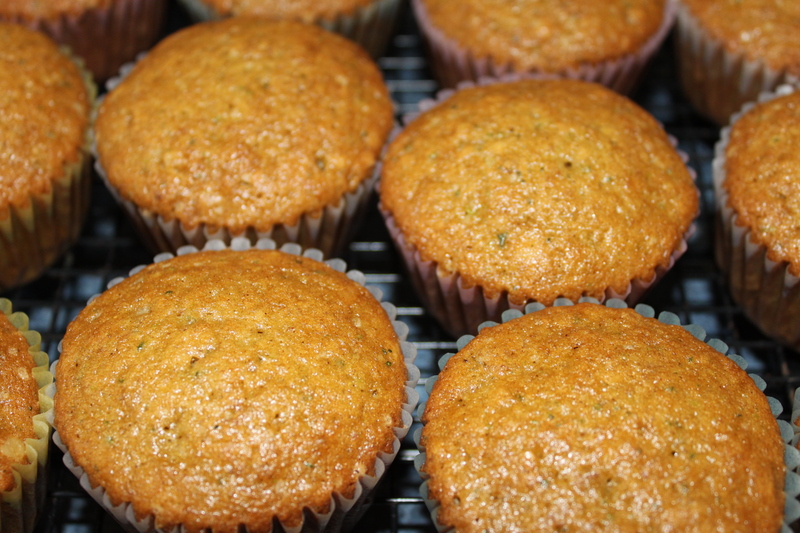 I’m sure you could use either granulated sugar or brown sugar or a combo of both although the raw sugar in this recipe did give the muffins a really great flavor. If you experiment, let me know how it goes.